Janis Lyn Joplin (January 19, 1943 – October 4, 1970) was an American singer-songwriter who first rose to fame in the late 1960s as the lead singer of the psychedelic-acid rock band Big Brother and the Holding Company, and later as a solo artist with her own backing groups, The Kozmic Blues Band and The Full Tilt Boogie Band. She was one of the more popular acts at the Monterey Pop Festival and later became one of the major attractions to the Woodstock festival and the Festival Express train tour. 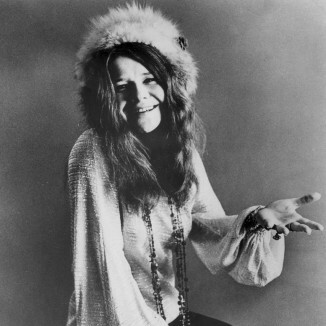 Joplin charted five singles, and other popular songs from her four-year solo career include "Down on Me", "Summertime", "Piece of My Heart", "Ball 'n' Chain", "Maybe", "To Love Somebody", "Kozmic Blues", "Work Me, Lord", "Cry Baby", "Mercedes Benz", and her only number one hit, "Me and Bobby McGee".